Grout can often feel like the bane of a homeowner's existence. This cement-based product is integral to nearly all tile installations, particularly bathroom tiles. Keep your grout in good shape to prevent damage to the substrate behind the tile. Replacing your grout doesn't happen on a regular schedule. Instead, the job is only required if something happens to the existing grout. Grout serves several purposes for a tile installation. It helps even out inconsistencies in tile sizes and helps prevent damage to tiles in the case of normal house settling or flexing. In the bathroom, grout also helps to prevent water from seeping between the tiles and rotting away the substrate behind it. Unfortunately, water can eventually wear down the grout, causing growth of mold and mildew and cracking of the cement. Normal house settlement and time can also damage the grout in your home. Grout can last for a very long time when it's not subjected to a lot of movement or water. Instead of relying on a set schedule to regrout bathroom tiles, inspect the grout lines periodically to ensure it's still in good shape. Grout that's cracked, missing or peeling should be replaced immediately. The longer that grout is compromised, the more likely it is that water will damage the wall or subfloor behind your tile, causing even bigger problems. Grout that is merely discolored due to water stains or absorption of dyes or minerals does not need to be replaced unless you want to improve the look. Cleaning and resealing grout can sometimes remove surface discoloration. Even if the grout lines remain discolored, they're still protecting the tiles and wall behind them so replacement isn't necessary except for cosmetic reasons. Grout that's growing mold or mildew, however, may be a sign of a bigger problem. Grout is porous, so when mold begins to grow on its surface, chances are that it is also growing deep inside. That growth can compromise the integrity of the grout, causing it to fail sooner. Mold can also cause serious health problems in some individuals. If bathroom mold and mildew removers don't stop the mold problem, regrout bathroom tiles to eliminate it. 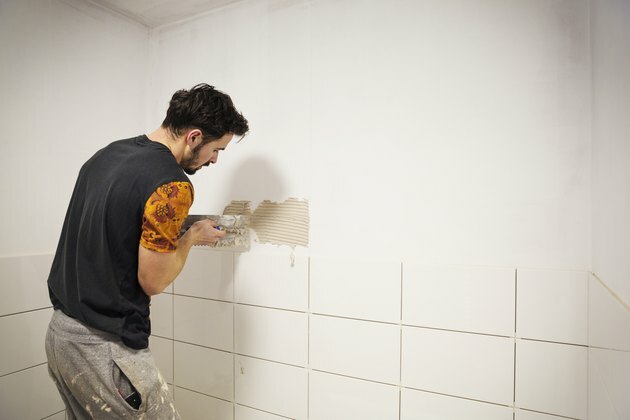 Before you go through the process of chipping out the old grout and mixing up a new batch, make sure that regrouting is the only thing you need to do. Listen for a hollow sound as you tap on your tiles to ensure water hasn't eaten away at the wall behind it. Check for loose or cracked tiles, which could indicate a larger structural issue than just cracked grout. Apply a mold or mildew killing solution to the edges of the tiles themselves after removing mildewed grout to help ensure it hasn't spread, and see that the entire installation has time to dry out thoroughly before applying fresh grout. Regrouting your bathroom tiles gives the space a fresh look. But, more importantly, it ensures the grout works properly to prevent damage in your bathroom.